Beer Advocate, Firestone Walker Brewing Co., Recipe, Sierra Nevada Brewing Co.
With influences from many different cultures, the Hawaiian Islands have a culinary history unlike any other. 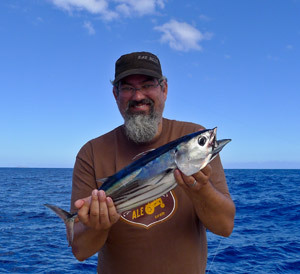 Fish are in abundance here—opah, ono, swordfish, marlin and tuna, among the countless others species that swim off the expansive coast and coral reefs. 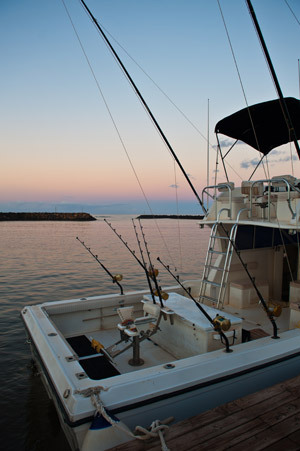 But what to do with all this amazing fresh fish? 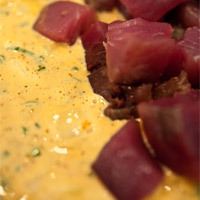 Poke is a local Hawaiian dish; the word means “to slice or cut into cubes.” Think sashimi-quality raw tuna made into a fresh salad. First, the tuna is skinned and de-boned. Then the blood line is removed, and the loin is cut into small cubes and tossed with a light dressing or marinade—similar to a ceviche, but there’s no citrus juice that “cooks” the fish with acid, so it’s more like a tartare. This showcases the light, full-flavored tuna. Accentuate the natural flavors with a touch of soy sauce, sesame oil, a crunch of seaweed, some sesame seeds or nuts, and a few veggies. Simple to make, this dish is perfect served by itself or with several other variations of poke; just add a seaweed salad, nori wraps and a pair of chopsticks. You can change or substitute the ingredients in any of these recipes to suit your own tastes. For a vegan version, try adding a cubed, firm tofu in place of the tuna. This recipe is for the simplest poke—nothing to hide behind, the high-quality ingredients shine together. In a medium-sized bowl, add the toasted sesame oil, soy sauce | tamari | shoyu | liquid aminos, Pale Ale of choice (something more citrus forward on the hopping will add a nice floral brightness to the dish) and salt; whisk until combined. 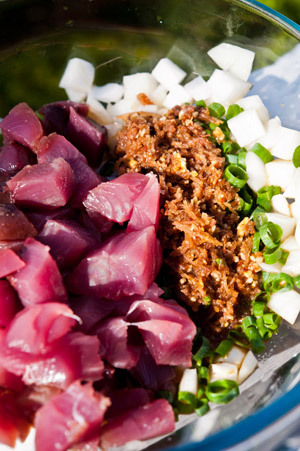 In another bowl, add the green onion, sweet onion, seaweed, kukui nut and the fresh tuna. Carefully mix together with a spatula, being careful not to break apart any of the fish cubes. 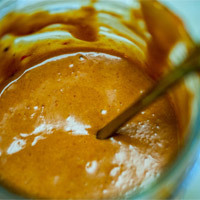 Next, re-whisk the sauce and pour over the tuna mixture. Toss to coat the poke evenly, then cover and let marinate in the refrigerator for at least 1 hour; can be covered for up to 2 days. Fresh seaweed can be found in some Asian markets or at a high-quality seafood counter. If you can’t find any, ask your fish monger to special order it. 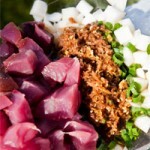 Each type has its own texture and flavor, giving the final poke its special twist. On the mainland, kukui nuts are harder to find. You can order them online. As this dish is raw, high-quality, ultra fresh ingredients are needed. If sashimi grade (sushi quality) is not available, have your fish monger order it for you, before making this recipe.